My first year in the program, I was so focused on getting all of the points on my assignments and participation, that I didn’t allow myself to be fully immersed in the learning experience. I was so caught up in perfectly matching the rubric, that I was spot on when it came to applying the theories and methodologies, but I wasn’t fully taking advantage of the opportunity to connect with the art of instructional design. There is a flow and beauty to a well-designed learning experience. Where learners are engaged, active, practicing and able to use what they learned when they click out of the software or walk out of a room. Basically, they get it, they liked it, and they use it, all due to a clear and thoughtful design that has an energy and groove of its own. I was missing out on balancing the science and the art of instructional design. It wasn’t until my second year in the program that I was able to shift my focus from maintaining my 4.0 GPA to allowing myself to free fall, and take chances with my projects and thoughts that I shared. I expressed a deeper honesty in my posts about shifts in thinking, the exhilaration of success and the fear of failure. It was a real change for me to focus on the pursuit of excellence instead of scrambling for perfection. Now did I experience everything listed under perfection? Absolutely not, but I could see the possibility of it happening. And I wanted to be proactive. I keep a copy of the “Healthy Striving” side of this image on the wall of my office as a reminder. Make a list of the advantages and disadvantages of trying to be perfect. Increase your awareness of the self-critical nature of your all-or-nothing thoughts, and how they extend to other people in your life. Set strict time limits on each of your projects. When the time is up, move on to another activity. The ability to identify perfectionism is useful beyond individual development. The capacity to see it in clients, colleagues and learners can lead to strategies to approach interactions and situations clouded by perfectionism. These changes could lead to increased productivity and improved interactions. The result of my shift in thinking was a sense of calm and ability to focus with clarity and connect more deeply, professionally and personally. And yep, I still maintained my 4.0 GPA. I’m continuing the process of striving for excellence vs. perfection. I see it as a journey and not a destination. No one is perfect. And that’s wonderful. Some of the world’s biggest “mistakes” and “failures” have led to innovation and positive change. Embrace excellence, you won’t regret it! In what ways could you apply what you read? 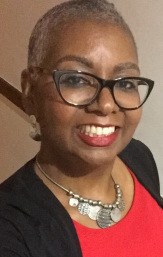 Niké is an instructional designer and trainer with a passion for organizational development, dancing, laughing, fabulous live music and a great meal. She will complete the MATD program at Roosevelt University in a few weeks and is going to miss working as a Graduate Assistant for the Training and Development Department. Due to her naturally social nature, she is looking to connect with as many ID and OD professionals as possible. Connect with her via LinkedIn to stay in touch. Perfectionism- The Soul Eater- I enjoyed reading your personal experience and how you compared some of your perfectionism to your health striving. I can relate to this so much as being in the MATD program myself. This will help me to learn how to improve to be focus but not scared of the unchallenging and failures that most student may come across. congrats on your MATD program. I am looking forward to this myself. I appreciated this post as I struggle so much with perfectionism it takes the joy out of everything for me. My focus was always more on the grade than what I took away from the course, which I know is the wrong approach but I still can never seem to change it. I still obsess about making assignments perfect and consequently I’m usually late submitting them fearing they won’t get a perfect grade. Thus far, not many of the suggestions above have made it better for me but perhaps with some therapy intervention it might. Thanks for your thoughts! Excellent article, I definitely struggle with perfectionism and it can be so obstructive to the creative process! I’m in agreement that done is better than perfect and will strive better to set hard deadlines for myself. Nice work. Thanks for sharing this invaluable perspective, Nike! It’s a great reminder that striving for perfection will leave a whole lot of things to celebrate behind. To apply this, it will be important to recognize smaller steps toward long-term progress. Rather than trying to make everything perfect, I’ll do my best to take your good advice and enjoy the journey. Congratulations on your academic and personal success! Your wise words will be put to good use as I work towards my degrees as well. Thanks very much and best of luck! Great Post, Iam too concerned about my GPA, but I have learned that being too concerned mistakes are made and information is missed. Thanks! It’s ok to make mistakes. That’s part of the process. It’s how we learn. Try to enjoy the process and the interaction as you keep your eye on your grades. Good luck! Niké! How wonderful to read your post and yes, the beast that is perfectionism can be a challenge and certainly intrude on our learning! I appreciated your insights into your process through the program. I, too, found myself very focused on structure and rubrics at first as I was returning to school after quite a long time I wanted to “do it right!” Once I shifted to diving into the learning my experience improved profoundly and my learning was much richer! The excellence vs perfectionism dichotomy is a very worthy one for my thinking and attention, thanks for putting it out there. 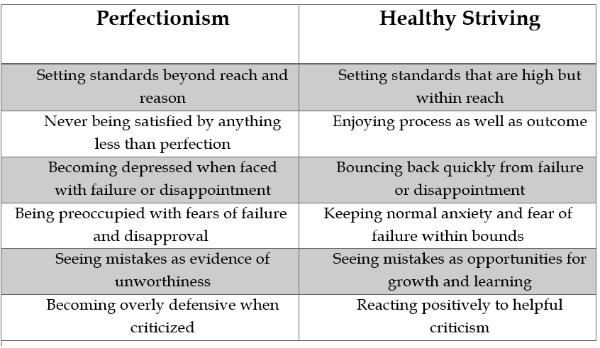 A quote I appreciate related to this: “Understanding the difference between healthy striving and perfectionism is critical to laying down the shield and picking up your life. Research shows that perfectionism hampers success. In fact, it’s often the path to depression, anxiety, addiction, and life paralysis.” Brené Brown, The Gifts of Imperfection: Let Go of Who You Think You’re Supposed to Be and Embrace Who You Are. Maureen! So glad to hear from you! I love that quote. I’m completing a module as a part of my onboarding process in authenticity and self awareness. Putting the shield down is a big part of that training. I miss you so much. Graduated in May 👩🏽‍🎓! This post I must assure you that I can realty to this in so many ways and aspect of how I was once focusing on the points and grades, instead of the experience that can help lead you into more success. Being able to use the experience in anything that you learn or go through can be the joy in helping who you are and develop better into what you can accomplish in life. However I think for me its just a thought to always keep in mind to always try to divided the two when thinking of experience or points. Glad you can relate and thanks for posting. I completely agree, we learn as we go. So important to remember. Thanks for the post and perspective. I really like how you say strive for excellence rather than perfection. I would disagree that perfectionism is always beyond reach and logic. I do think that when people focus on perfectionism that often times the significance or purpose of the act itself is lost. Thanks so much for your thoughtful reply Selma. I hope you can use the parts of the post that worked for you. I would be interested in hearing more about your views on perfectionism being attainable. For me perfection means nothing goes wrong. Do you think humans can attain this level of performance? Thanks! I hope to hear from you. Thank you for your enlightening insight, Niké! It is definitely easy to lose sight of the bigger picture when we are so focused on the tasks we have at hand. With perfectionism can produce favorable results, it can also take away from other areas. Having exposure to topics unrelated to our major or our main focus can help to give a fresh perspective and exercise other areas of our thinking. Through my experiences, I’ve learned to not be so harsh in criticizing myself and to realize that every situation presents a lesson and opportunity to learn and grow! Thanks for the great response. Looking at situations and outcomes as an opportunity to grow is a great way to approach corrections or improvements for outcomes. Take care and good luck! Thanks for the post Nike, I came to a realization half way through my time at RU that I needed to go “easy” on myself and not be a perfectionist when it came to my work. I could spend hours and hours making sure the sentence had the best words possible but after a while had to be ok with the effort that I put in. It made for a more healthier lifestyle. I’m so with you Michael! Time waits for no one. Especially in our industry. It was so great learning with you during my time in the program. Enjoy the rest of your time learning and growing. This posts definitely hits some familiar buttons that I think many individuals face at some point or another. It’s hard not to strive for the absolute best and a “perfect” situation in all instances, especially when it comes to something like a formal education. I apprecaite how the post draws out the importance of being in the learning and experiencing it in a way that becomes more tangible than just a memory game. It how one’s continues to enjoy the process of learning and to see it as a chore or a race to the grade. The hope is that what we learn is actually applied in a meaningful way, and by fully being present we reach greater success. Exactly! The journey is just as important as the destination. Good luck on your journey through this program and beyond. Fantastic post, Nike – and I wholeheartedly relate! In reading your piece I realized that, while I continually remind my students that the process is more important than the product I don’t know that I always remember that in my own work. And your point about how embracing the process perspective provides not only a sense of calm, but also leads to more honest and genuine personal/professional relationships is spot on! I think I’m going to print the right side of this chart for my desk as well! Hi Kristen! So great hearing from you. So glad you liked the post. We all need those reminders :-). Be well. Great post! This really puts it into perspective on how some people think. I’ve never been a perfectionist and it really puts it into perspective. I’ve always been a bare-minimum student, and reading this makes me want to work better towards a healthy strive. That’s a great use of the chart Zeinab! Thanks for reading and responding! I actually love this post and sent the table to my friend. I realize that sometimes we tend to think about the end goal instead of focusing on the process, when the process also greatly contributes to what we become. Thanks so much for this much needed post! Thanks Alberta! I’m so happy to hear that you found the post useful. Take care. Thanks for reading and responding Monique. Absolutely! Also, the pace at which outcomes and completion are expected don’t allow for a perfectionist perspective. There simply isn’t enough time to consistently mull over everything repeatedly.